The Abbey of St Benets lies on a sand and gravel island called Cow Holm surrounded by grazing marshes beside the River Bure. In the Middle Ages it was approached by land along a broad causeway from Horning to the northwest and by river along the Bure. It is quite likely that the causeway was only usable during the summer. The place has an over-riding sense, even today, of extreme isolation, and no doubt before the marshes were drained in the eighteenth century it was often a true island. Most of the site is owned and managed by Norfolk Archaeological Trust. Most visitors reach the site having moored their boats along the bank of the River Bure to the west. By road, there is a turning near Ludham Hall Farm marked by a small unobtrusive wooden fingerpost pointing down the farm lane which leads out to the long concrete farm road over the marshes. While there is no formal right of access by car to the site, the farmer does not mind cars using the farm track in small numbers, provided that the cows which are driven up and down for milking twice a day have right of way! Limited numbers of people, mainly fishermen, do make the car journey down the track and then park near the farm buildings when the end of the farm road is too muddy (as it often is) to drive further. A site guidebook is on sale in Horning church. Services, with the Bishop of Norwich as preacher, are an annual tradition. Usually about 100 to 150 attend, and they come by car and by boat to venerate a place which has seen centuries of prayer and contemplation. See local press for details of future services. A new guidebook was published in March 2008, and should be available through local bookshops (Pestell, T., 2008. 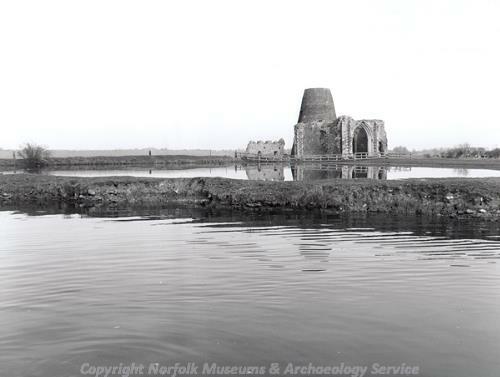 St Benet's Abbey A Guide and History)(Norfolk Archaeological Trust, Norwich)(ISBN 978-0-9540676-2-5).